Games Components There are 5 products. 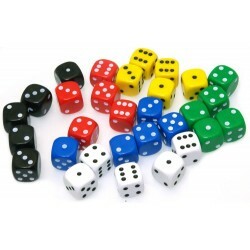 Box of 50 traditional, 6 - sided, 12mm dice available in 6 colours. Box of 50 traditional, 6 - sided, 14mm dice available in 6 colours. Box of 100 traditional, 6 - sided, 12mm dice available in 6 colours.